We had everyone together for the gift opening and the onesie came out blue (actually white with very pale blue letters and trim so no one was sure until I yelled IT’S A BOY! with tears rolling down my face). It was everyone’s hunch confirmed, the first boy in two generations, it instantly felt right. My only real intuition was that boys’ names have been coming to me much more than girls’ names, and the amount of wild movement has made me picture a boy. I was awake in the night actively trying to stay ready for anything, but it was really starting to lean one way. Many reasons to love a boy, most of all because he’s mine. Hurray!!!!!!! SO happy!!! 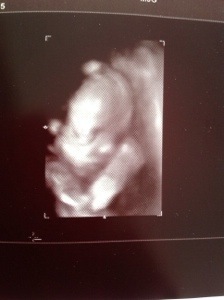 Mine is STILL a boy (first time I was able to confirm this with my eyes). 🙂 Congrats!!!!! Totally my hunch, as well, just for the record. You just weren’t estrogen-y sick enough seeming for a girl. Hooray! Here’s to smooth sailing ’til you meet him. Congrats!!! I just love having a boy so much! Super exciting to be the first in your family in a while! You are going to be the best mom that lucky little guy could ever wish for! So happy for you, friend!! !